Ruggles is a good boy! Good boy, Ruggles! Who’s a good boy? Ruggles is a good boy! Good Ruggles. That’s a good boy. That’s a boy! 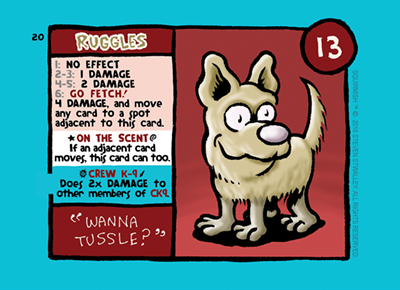 If you roll a 6 on Ruggles’ basic attack, in addition to doing 4 damage, his Go Fetch attack lets him move any card in play to a spot next to him. This is good for making it so he can attack whatever card you want him to next turn… and for moving particularly nasty cards away from a position where they can attack Ruggles. Using his special ability On the Scent, Ruggles can move any time a card adjacent to him moves. Ruggles is a member of Crew K-9… and as such does 2x damage to other members of Crew K-9, as they all love a good fight, but can get a bit carried away. Squirmish is now on Kickstarter here. This is a series of posts designed to help you learn a bit about some of the cards before you play the game. 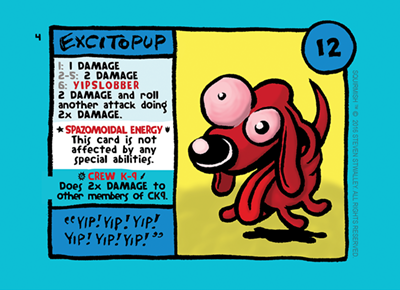 Card #4 in the Squirmish deck is Excitopup. Excitopup is always excited… dangerously so. If anyone near Excitopup ever utters the words “walkie” or “dinnertime” or “get off of my leg” they soon regret it. Excitopup’s basic attack always does damage… and if a six is rolled on it, Excitopup’s salivary glands go all Pavlovian, and he does a second attack doing 2x damage. Excitopup is so darn excited all the time, that special abilities don’t even have an effect on him… he doesn’t even notice they are happening as he jumps up and down with completely focused obsession on the one single thing that can occupy his wee little brain at any time. Excitopup is a member of the group Crew K-9 (the mortal enemies of the Kitty Kat Club). All members of Crew K-9 do 2x damage to other members of Crew K-9 when attacking them, as they all love a good tussle.